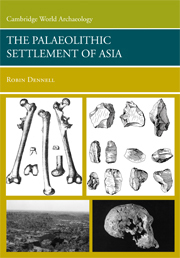 The palaeolithic settlement of Asia / Robin Dennell. Migrations. 4. Antiquities, Prehistoric – Asia. 5. Asia – Antiquities. Cambridge University Press has no responsibility for the persistence or accuracy of URLs for external or third-party Internet Web sites referred to in this publication and does not guarantee that any content on such Web sites is, or will remain, accurate or appropriate. Information regarding prices, travel timetables, and other factual information given in this work are correct at the time of first printing, but Cambridge University Press does not guarantee the accuracy of such information thereafter.